Eco-friendly initiatives in Bengaluru: will Ganesha Chaturthi be greener this year? Ganesha Chaturthi is celebrated with great aplomb throughout the country. Meanwhile, efforts to avoid the immersion of idols made of Plaster of Paris in lakes which causes irreversible damage to the aquatic life and the lakes is underway in Bengaluru, the city of 1000 lakes, which has managed to retain some lakes. Like every year, the BBMP has sent out circulars on the environmentally friendly measures to take, while the Central Pollution Control Board has issued orders to the state government. This has resulted in eco-friendly celebrations gaining popularity in Bengaluru. Seed Ganeshas are gaining popularity. A typical seed Ganesha set has a clay Ganesha idol, a container to immerse the idol and some compost. There are many variations of this too. The Ganesha is usually not painted, or painted using water colours. Once the idol is immersed in the container, the compost is mixed with it. The seeds embedded in Ganesha idols or the compost germinate and plants grow out of it. Citizen Matters found three examples of seed Ganeshas. 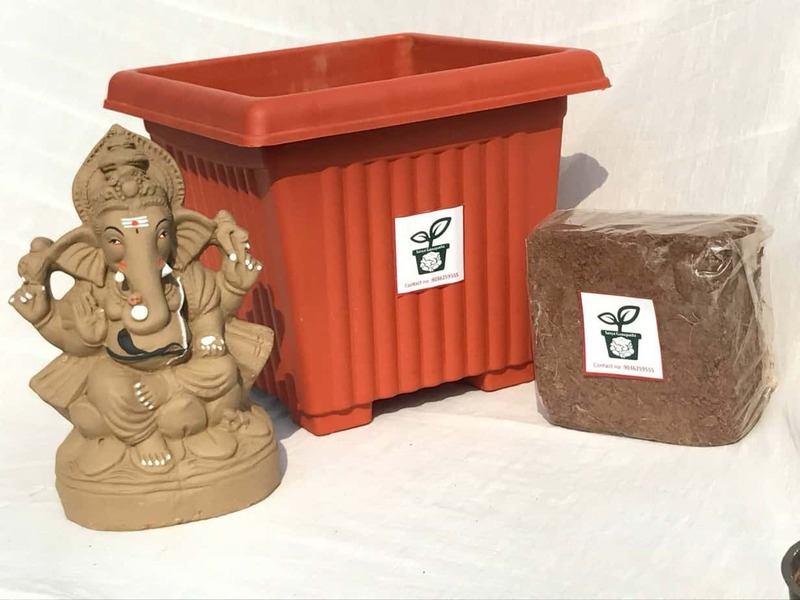 GreenMyLife, a company that sells gardening products such as plant bulbs, pot accessories, seeds, and landscaping maintenance services sold eco-friendly Ganeshas. Unlike previous years the Ganesha idols don’t have the Holy Basil (Tulasi) seeds inside them but are sold separately from the clay. The set has a growbag and the company advises against immersing (visarjan) in the grow bag, as the water could flow out through the drain-holes. The Tulsi seeds are not put inside the idol because the seeds stick to the bottom and do not germinate. The clay after 30 minutes of immersion is put inside the grow-bag, along with seed mixed with the soil and cocopeat. Sasya Ganapathi, started by IT professionals Punith Kumar N and Vivek N, took online orders only through the online medium. 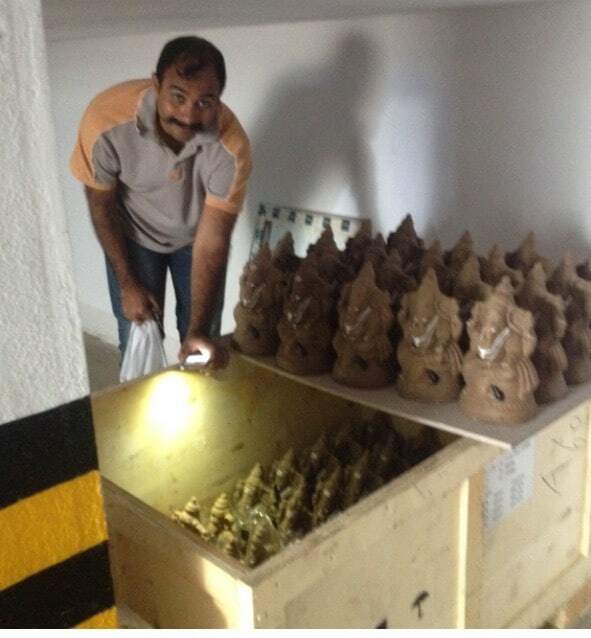 The start up makes Ganeshas with the help of cement moulds to shape clay into Ganesha. The kit of seed packets, nutrient blocks, potting mix, a visarjan pot, including delivery charges costed Rs 1500 for a Ganesha idol of 12 inches height, and Rs 2000 for 15 inches. As many as 600 sets were sold online in Bengaluru, according to their estimates. E Club of Rotary Green City, an off-shoot of the Rotary Club of India in Bengaluru, is a group of 10-15 volunteers who take up environmental, and healthcare initiatives for the poor. 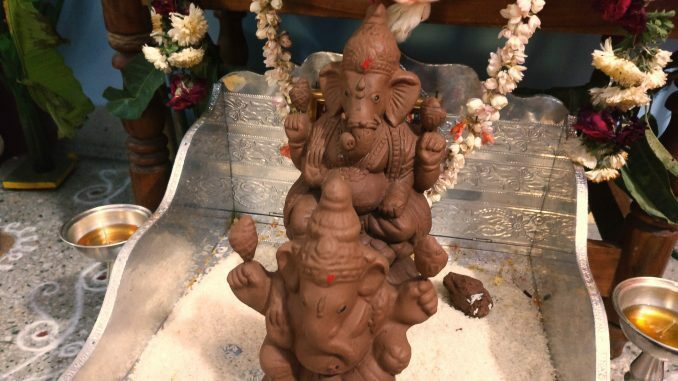 Their goal this year was to sell 1000 Ganesha idols made from clay by local artisans in Pottery Town, who were given specific directions not to use even water colors. The proceeds are going towards an in-house education programme for girl children. The eco-friendly seed Ganeshas of 12 inches cost Rs 550 with the whole package of Tulsi flower seeds, and a visarjan pot with cocopeats. The members themselves are entrepreneurs, IT, CSR and healthcare professionals. Going by last year’s success of personally delivering more than 200 eco-friendly Ganesha idols to doorsteps, they decided to scale up operations and use their own offices spaces as pick up points. “We wanted to use the Dunzo app, but realised it would be hard to depend on it for a 1000 orders. We don’t trust any private transportation as the mud idols might break and develop cracks. We want to maintain a personal touch without parceling them in boxes,” said rotary club member Pallavi Chengappa. The team delivered orders even on the last day. Receiving of orders online in bulk from communities helped. For example Prestige Shantiniketan coordinated the dispatch of 100 idols through a single person. “Though we are completely open to single orders, we don’t feel the pinch of travelling ourselves each time to the pick up location, as we deliver at least 10 items per order as more and more communities are seeking us out,” said Pallavi. Customers of Rotary E Club displaying the clay idol. Era Organics in Malleshwaram also had seed Ganeshas and Gowris for sale. Meanwhile, local artisans selling clay Ganeshas and Gowris in roadsides of major market areas like Malleshwaram, Gandhibazar, Girinagar and other areas continued to sell them without any fanfare or publicity, like every year. 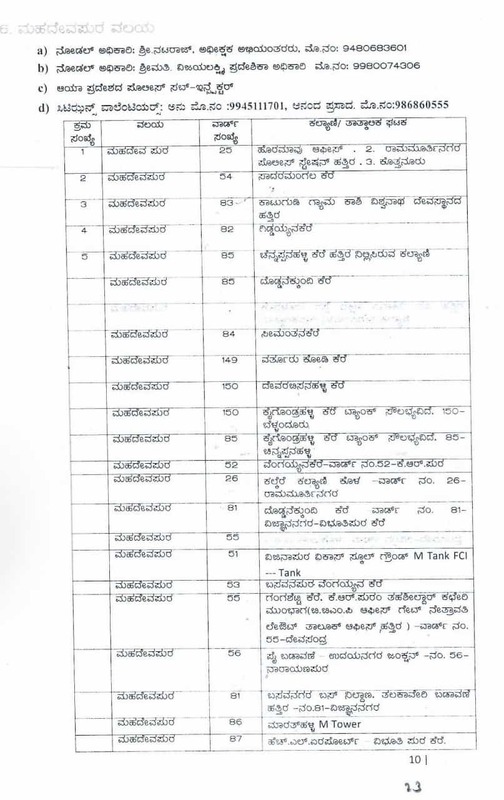 List of lakes in BBMP limits that have immersion facilities. Make the Ganesha Chaturthi memorable with clay idols, to retain the tradition and contribute to a non-polluting celebration in Bangalore. Even if you aren’t celebrating, spread the word in your neighborhood.